This series features white bezels and bands with mint green and turquoise blue accents. Green is used for the button function names on the bezel, analog hands, and tinted LCD displays (along with buttons on the last two models). 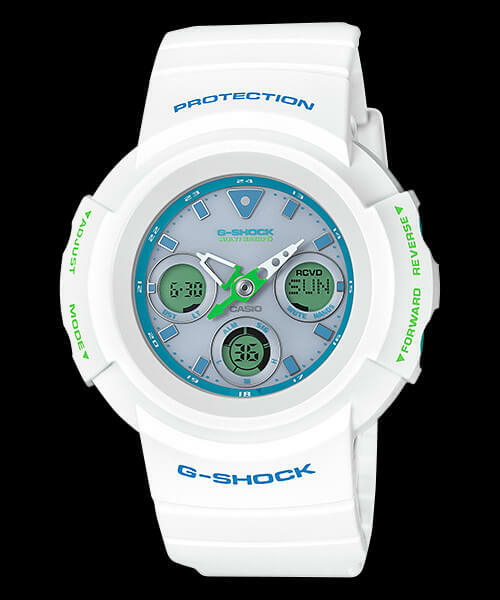 The G-Shock and Protection logos and indexes are blue. This series consists of all analog-digital models including two Tough Solar/Multi-Band 6 models. Models include (left to right): AWG-M100SWG-7AJF, AWG-M510SWG-7AJF, GA-110WG-7AJF, GA-400WG-7AJF, and GA-500WG-7AJF. Update: The GA-110WG-7A, GA-400WG-7A, and GA-500WG-7A are April 2017 releases in Asia. Update 2: The GA110WG-7A is getting an American release with a list price of $120 USD. AWG-M100SWG-7AJF: A Tough Solar/Multi-Band 6 model and a standard-size (i.e. 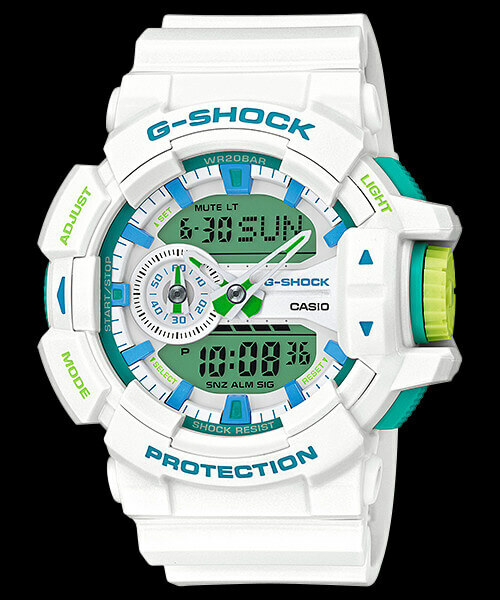 not extra-large) G-Shock. This is a Japan-only model. 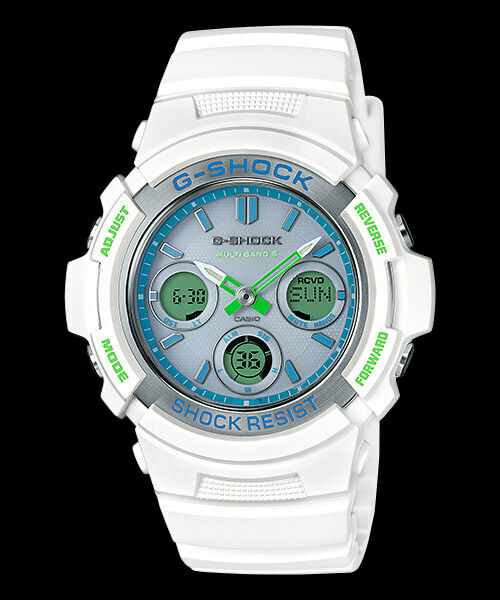 AWG-M510SWG-7AJF: A Tough Solar/Multi-Band 6 model that has the same exterior case as the first-ever analog G-Shock model. 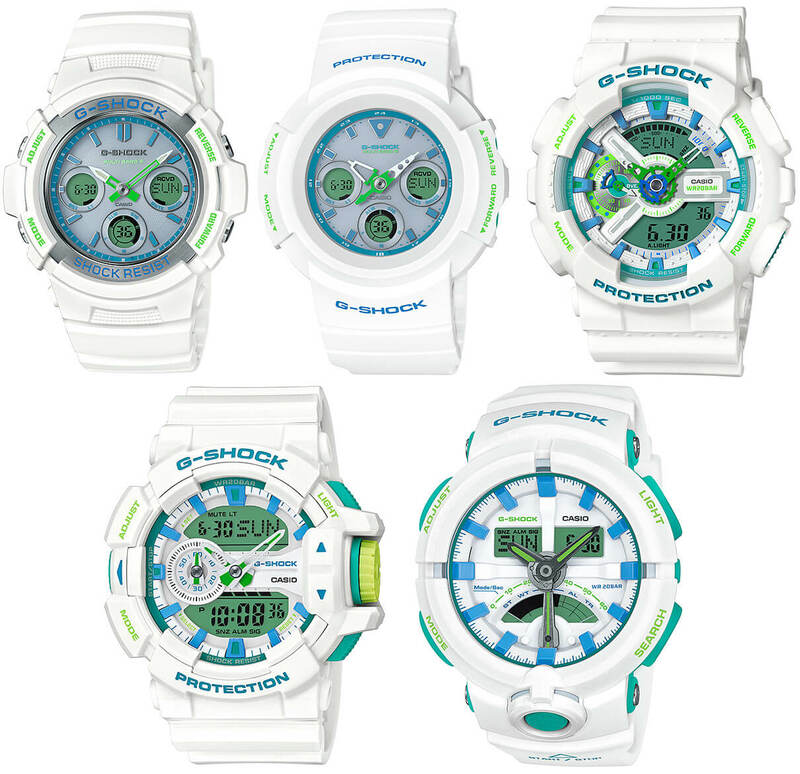 AWG-M510S watches are typically a Japan-only release. 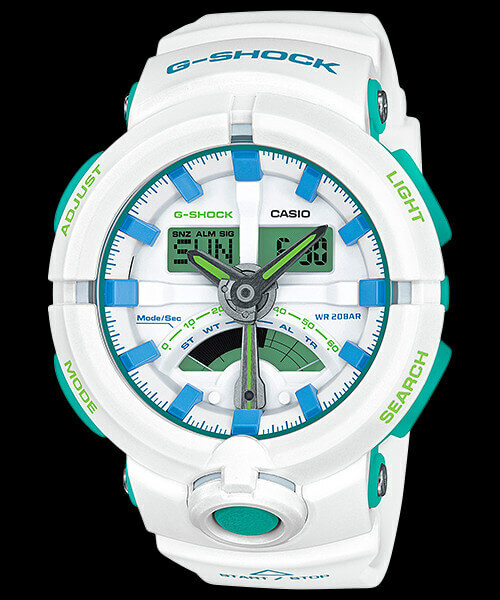 GA-110WG-7A: The extra-large analog-digital case that is a popular choice for streetwear fashion. GA-400WG-7A: An extra-large model with a rotary switch for easy access to functions. 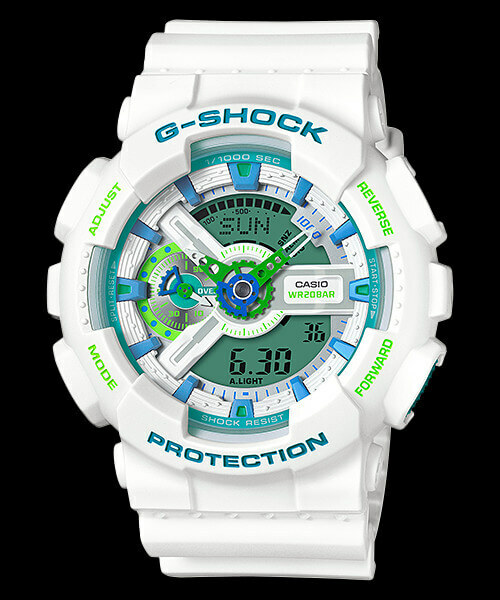 GA-500WG-7A: From the recently released GA-500 series designed for competition in action sports, featuring a front stopwatch button with one push direct start and target time notification.